The Fire Rises: Can France’s Hollande Ban Protests That Involve Millions? 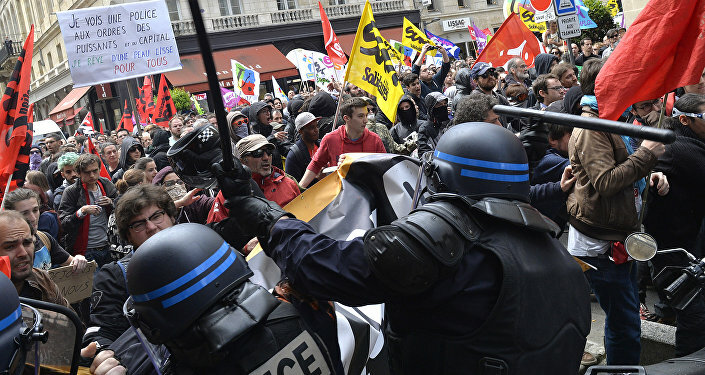 As French President Francois Hollande faces more strikes and unrest against the new anti-labor law, he has threatened to ban protests entirely. Radio Sputnik’s Loud & Clear is joined by Steve Hedley, Assistant General Secretary of the Rail, Maritime and Transport Workers Union (RMT) from London to discuss where this will lead. "[Hollande] may actually do it, but people will just start breaking the law. [Hollande] should start negotiating and stop making idle threats," Hedley tells Loud & Clear host Brian Becker, referring to the French president's threat to ban mass protests is real. Asked why Hollande would make such threats if he can't effectively stop the protests, Hedley notes that this move is hard for him to understand, but assumes the president is acting out of panic. The last demonstration in Paris involved, by some estimates, one million people, in addition to protests in other French provinces. "He can't honestly believe he can legislate this out of existence," Hedley says. President Hollande called the Euro 2016 Football Championship that currently takes place in France another reason to ban the protests. Asked how these two events relate to one another, Hedley noted that he doesn't believe they affect each other in any way, despite some reports of violence taking place among football fans. The protests give the impression of being a spontaneous "movement," Hedley wonders if there will be a point at which Hollande will be forced to cooperate. "It depends on what the European Union, the IMF, and the European Commission tell him to do," Hedley says. "[Hollande] is now between a rock and a hard place." Hedley also notes that in Britain, Euro 2016 is used as a media distraction from the protests that don't get the coverage they deserve. "I don't think they want [people] to see these protests as a good example", he says.